I got an email from a an online store called www.tmart.com, which sells a plethora of items from electronics to apparel. They asked to review one of their products they sell. I said I wanted nail art supplies to review, and they sent me a link for this product and I said yes!! I though it would be a great product to review because of all the items it comes with and the great price. This is not a scam there are definitely 48 bottles of nail art supplies. They are tiny bottles (one inch tall: top to bottom). They come with a decent amount of products and also come with duplicates. If you are a nail polish fanatic like myself, you might remember Ciate came out with this micro-bead or 'Caviar' which retails for about $25.00. This kit came with 3 metallic beads shades: navy (3x), red, and light blue. Then it also came with some transparent beads: gold, light blue (2x), and clear/white. This kit came with two types of chunky glitter (yes, I am calling it chunky glitter). There was five hexagon glitters: iridescent light blue (2x), iridescent neon orange (2x), iridescent light orange (2x), and shiny navy green (my favorite!). There is also a diamond shaped glitter, it is a iridescent white color (2x). These are just glitters that were shredded vertically. It came with a green, lilac (my favorite), a shorter red, neon yellow, iridescent white, and a surplus of silver (7x). I can probably use a silver glitter on every finger. I really like all the fine glitters. My favorites are all the golds: light silver tinted with gold (really specific, right? ), then a gold with a green tint (2x), and a bronze gold (2x). I am excited to do a gradient with the golds. Then there is a moss green, neon yellow, hot pink (2x), and snow white (2x). These are some of the 3D art, which is what I really wanted. It came with some red sequins, which is kind of.....erm.... not something I would use because I don't want to use it. I got these deep purple rhinestones. Then pink pearls, of course it has a flat back to apply to the nail. I also got some fimo cherries, which I am using it on my nails right now. Then some cute fimo honey bees, cute for spring and summer. Then I got a swirly thing, that I don't know what it is. Here are the nails I am wearing right now at the moment. I decided to use OPI: Big Apple Red and Andreas Choice: White. Though it was ruined and sticky, but it was good for making the dots. I followed the video Bubzbeauty videos she posted called Statement Cut Out Nails! It was super easy, but that is easy for me to say because I practice a lot ( not bragging). I decided to do the design based around the cherry deco. 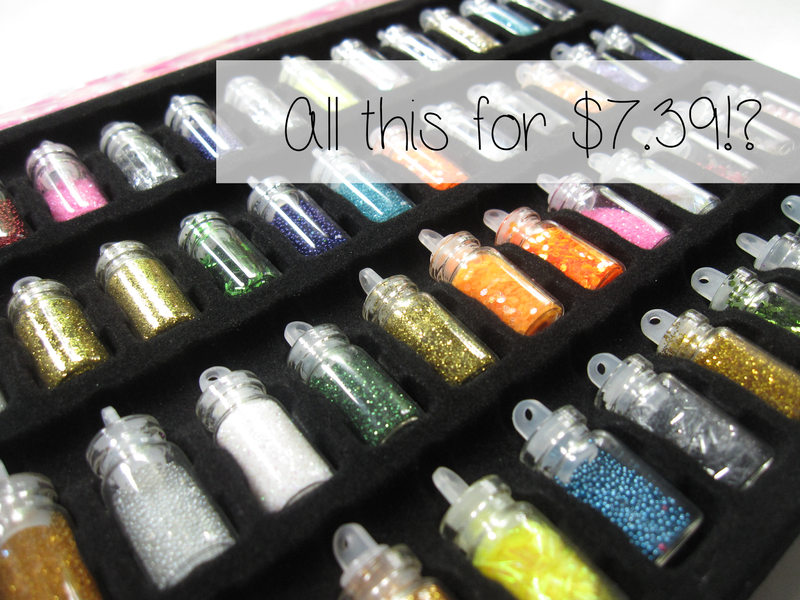 Would I repurchase: Probably not because this gives me a good idea on what I want in my nail art collection as well as helping it begin to grow. Where to buy: The only place I know of that sells this duplicate item is Tmart. If you are interested in this product you can purchase it at www.tmart.com. What is your favorite kind of nail art/polish? Very helpful post.This post gave me very beautiful idea to make my nail more attractive.